Coverage of Canada's federal election. 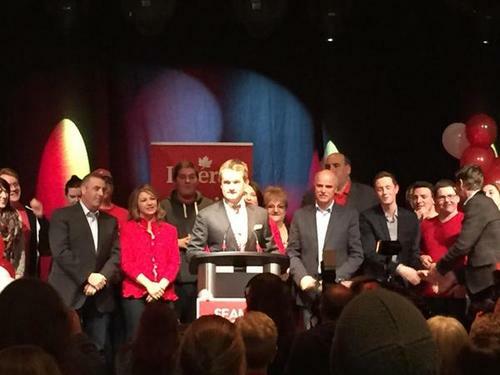 Liberals had led in Atlantic Canada polling - but were there signs of a win of this magnitude Éric? No, nothing this big. The party was polling at about 54% on average, and they are well above that. And to be beating both Conservatives and New Democrats, including Jack Harris and Peter Stoffer, is rather stunning. WATCH NOW: Raw tape of NDP leader Tom Mulcair watching election results on our “NDP Live” online channel. The polls were suggesting the Liberals would do very well, but they are certainly out performing that. At the moment they are at 31 seats, while the polls were suggesting 27 at most, as both the NDP and Conservatives are underperforming expectations. The NDP, in particular, have to be crushed. Jack Harris and Megan Leslie are two of their highest profile MPs, and they are both trailing. Strategic voters may be flocking to the Liberals. We'll have to see if this will continue beyond Atlantic Canada. Veteran Conservative Peter MacKay has weighed in on a big loss for the party in the Nova Scotia riding of Central Nova tonight. The riding was held by MacKay and his father for years, but the Liberals have claimed it tonight. Sean Fraser will be the new MP. Not sure our poll analyst can say... Éric? That is tough to say. Certainly the MacKay name meant a lot there, but we've seen all of Nova Scotia go with the Liberals. They are at 64% in the province right now. No one can survive that kind of tidal wave! We'll have to wait and see. Atlantic Canada has been polling strongly for the Liberals for a long time, so there is the possibility that this is more localized. But this is undoubtedly beyond the Liberals' expectations. Their chances of a majority have certainly improved. So far turnout seems to be on par with 2011, but we won't know for certain until all the votes are counted. The Liberals won all but one seat in Atlantic Canada in 1993. They might beat that tonight. There is one Quebec riding that is on Atlantic Time - so poll closing times there match the Maritimes. There are 25 ridings alone in Toronto! But this is definitely a great start for the Liberals. Horrible one for the other two parties, who would have at least aimed at two or three seats apiece. Two very prominent NDP losses in Nova Scotia. Peter Stoffer, a veteran NDP member of Parliament in the riding of Sackville-Preston-Chezzetcook, has lost to Liberal Darrell Samson. Both of those NDP losses are surprising, but Stoffer's is particularly striking. He took 54% of the vote in 2011. Leslie took 52%, but the provincial Liberals did very well in Halifax in 2014's provincial election. Éric - I know you have to leave us again shortly. But what should we be watching for as the polls close in Ontario and Quebec through to Alberta in 30 minutes? What will tell the tale - which ridings, by how much, for whom? I'm going to be watching NDP ridings. The Conservatives have struggled in Atlantic Canada for some time, so it could be a local move against them. But if we see Liberals winning NDP-held ridings, that could signal that strategic voters are swinging to the Liberals. If that happens, a majority government is very much in the picture. Back to CBC Radio One for me! What a surprising night so far. Thanks again for your analysis! The night is young.